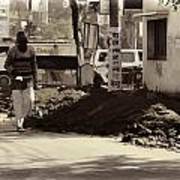 There are no comments for Digging A Ditch At The Side Of A Road In Roorkee. Click here to post the first comment. 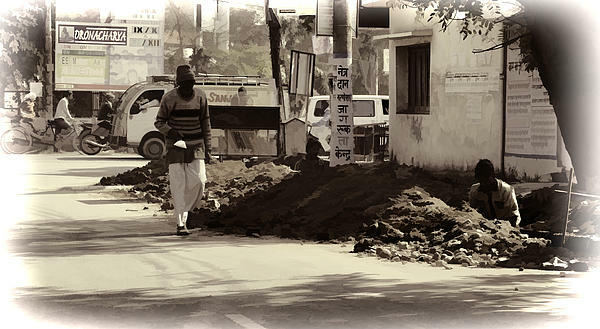 A man digging a long ditch along the side of a road in the town of Roorkee, in the state of Uttarakhand in North India. Such ditches are typically dug by hand, and can be dug for any number of reasons, such as for laying cable or electricity wires, or for water or sewage pipes, or for some other similar reason. 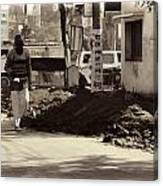 However, in a number of cases, this digging remains open or not properly relaid for quite some time, which causes inconvenience to regular commuters. Another man is walking by and a busy road is seen in the background.